Wed. Sept 12th.  17C  At 4 am Norm H. was aroused from his sleep by the sound of raindrops upon the tent that resulted in everyone rushing about to take drying clothes off the line. We heard thunder in the distance and for the next three hours endured a steady pelting rain  the thunder and lightning storm again circled us four times  which was becoming the "norm" here. By 7:30 am, we began to pack our equipment inside the tent and ate a well-prepared breakfast in a light drizzle. We waited for the inclement weather system to dissipate before we made our way by crossing Threenarrows Lake under clear skies and calm waters at 10 am. We noticed that the second campsite was occupied and were glad that we made the right decision to camp where and when we did. Passing a cottage on a small island, we were informed by its owners from Ohio that the United States had been attacked and that there was a great loss in life and property  four commercial airplanes had been hijacked, two of them slamming into the World Trade Centre in New York City, a third into the Pentagon, and the last one into a field in Pennsylvania. We were stunned. John and Norm R. were anxious to get back to Ottawa where they worked in key roles against terrorism; however, there was no way of getting out of the area until at least Saturday. Our enthusiasm waned - we couldnt stop discussing or thinking in silence about the disaster. Our prayers were with all the victims and their families, both American and Canadian. We zigzagged through the southwestern channel and, attracted to the remoteness of the park, were able to identify some ideal areas for future campsites. The only noises to be heard were from the swirling eddies that followed each stroke of the paddle  just blissful silence and a time to reflect. We passed one ridge where hundreds of brown dead trees were observed  why here and not anywhere else? After two and a half hours of paddling, we stopped to filter water prior to crossing the Threenarrows Lake dam (19P50) and the six subsequent portages through Kirk Creek to McGregors Bay. We walked across the dilapidated dam and read the inscription on an abutment and wondered how much more time the dam had before collapsing  when it does, it will drastically change the whole eco-system of Threenarrows Lake  hopefully some proactive plans are in place to prevent this from happening. As we were about to leave, two men and two women could be seen approaching the portage from Kirk Creek. They appeared exhausted and frustrated from having to portage around so many obstacles (7 portages = 360 metres) that covered only 2 km through this meandering creek over a two-hour period. We learnt that the landings were less than optimal and care had to be used during loading and unloading. As a show of "goodwill", we helped them haul their canoes and equipment around the dam. They were from North Carolina and not aware of the catastrophe that happened in their country two days ago  they stopped for a while to try to absorb what they had just heard before slowing moving on. The water level in Kirk Creek was extremely low and submerged rocks and logs could be seen everywhere  at times, it was like paddling through a maze. 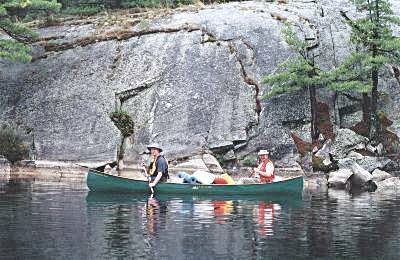 After paddling a very short distance, we were faced with traversing over a large, smooth rock surface that completely blocked the creek  the four of us formed a line to transport both equipment and canoes over it (20P50). We now understood the frustration of our American friends because we no more than loaded up our canoes and turned a bend in the creek when we had to portage (21P20) again around a waterfall. The cool wind and the drizzling rain didnt dampen our spirits and we pursued on. At the next portage (22P75), we were stopped at a logjam where we could have easily hauled our canoes over, luckily, Wayne decided to investigate  there was another waterfall in our way around another bend. If we had passed over the logjam, we would have had to backtrack over it and to the portage entrance. At this time, it began to downpour and we took cover under a tarp where John had an opportunity to change to warmer clothes as the rest of us put on our raincoats. 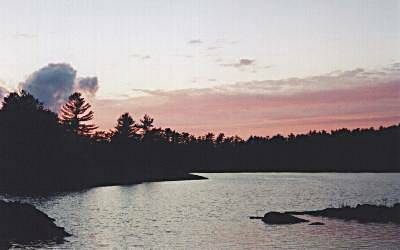 At the end of this portage, the steep embankment consisted of slippery roots and muddy clay  for safety purposes the four of us assisted each other to stow the equipment in one canoe at a time. Five minutes later, we reached another waterfall and, after some debate, we decided to forge around it (23P50) rather than carry the canoes over it. It wasnt as easy as it first appeared  it meant carrying our equipment and canoes up and over a wet rocky gorge wall. On our second trip, we slashed through the trees and brush to the point of entry  in doing so, John tripped on some brush and nearly wrenched his knee, which would have been devastating to all. Paddling across a small pond, we heard water cascading over a high waterfall  we were able to get close enough to its top with our canoes to gaze over to the pond below and the vale that followed. Searching for a portage sign without success, we climbed (24P50) over an enormous rock surface on one side of the waterfall to reach the pond. We started off through a beaver meadow and then a serpentine wetland channel brought us to a cul-de-sac and no portage sign in sight  we later observed that it had been removed from a tree - we learnt afterwards from an outfitter that missing signs were either being taken by souvenir hunters or more than likely torn off by a black bear who seem to be attracted to them. The path (25P40) circling the dried up waterfall was extremely narrow with a muddy embankment  Norm R. became the first casualty as he slowly and helplessly slipped into the water, much to everyones amusement. Meandering through a narrow waterway, Wayne indicated that the height of the water and the scattered chewed off branches meant that beavers were present. In no time, we encountered yet another beaver dam (BD 9) and had to drag our canoes over it. Our final portage (26P75) was very effortless and a well deserved experience. Portaging and lifting the equipment in and out of the canoes so many times over two kilometers did take its toll and we counteracted this loss of body energy by eating snacks and drinking water on a continual basis. None of us, surprisingly, felt any frustration, as this was the type of adventure we were seeking. Kirk Creek finally led us into the massive marshlands of McGregor Bay where several flocks of ducks, their wings thundering in unison, took flight. Undaunted, muskrats could be seen and heard diving into the water upon our approach. The marsh grasses and lily pads were so abundant and dense that it was difficult to navigate and determine the flow of the channel. At one point, Wayne had to gingerly stand up in the canoe to survey the area. We finally reached Georgian Bay, famous for its rugged "archipelago" of granite islands and windswept pines. We had intended on staying at campsite 137; however, after a quick survey, we decided to search for a better one. Again, continuous map verification was extremely important  the avoidance of disorientation among the numerous islands and inlets was always our main objective. We followed the shoreline and faced headwinds until we paddled through the narrow, northern straight between East Sampson Island and KPP where we turned into East Channel. 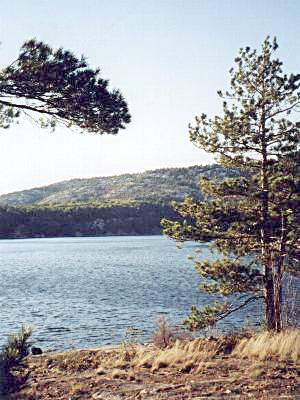 The barren islands and mainland consisted mainly of whitish rock and sparse coniferous trees, a sight to behold. 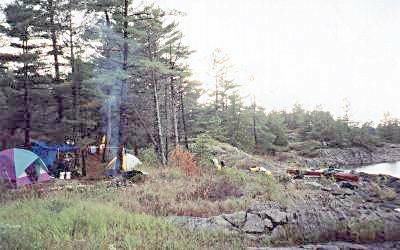 The first campsite (136) was located on a high, rocky point with a view of East and West Channel; however, providing no protection from the westerly winds and an area for only one tent. On route to the next campsite (4 Site 135) located in a nearby cove, a startled river otter greeted us by poking its head in and out of the water and making gurgling sounds before disappearing. It was now 5 pm and we had no choice but to accept this bleak site. As we walked upon the tenting areas, water oozed out of the moss from the days storm  tired, yet undeterred, we covered these areas with our larger tarps and set up our tents and flies after they were wind dried over a makeshift clothesline. As we unloaded the canoes, we noticed that certain areas of the shoreline were covered with lava rock, some pieces polished so fine that one would have thought it had been done by machine. Although the dark clouds and strong winds threatened rain, we were granted a reprieve. Throwing caution to the wind, we set up the extra tarps between the trees for a makeshift kitchen and eating area. The available firewood was soaked; however, Norm H. managed to get a blazing fire started by making "feather sticks" and using tin foil as a heat reflector. The damp wood was strategically placed around the campfire to dry and was used later in the evening. The smoke from the fire and a light breeze definitely kept the abundance of mosquitoes at bay. 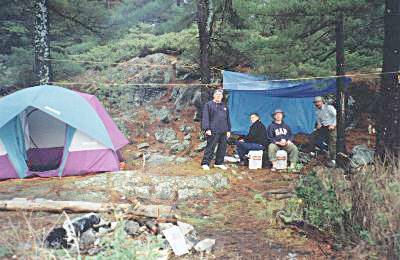 Everyone seemed to be in a good mood and put forth that extra effort to make the campsite a little more comfortable. Camped at the base of a cliff, we had to climb up and over it to walk a short distance into the woods to the privy - someone had previously put duct tape around the rim of the hole  no splinters! John did register a complaint the next morning of a particular odour near his tent; no one claimed responsibility. As we took in the splendor of a flock of Canadian geese flying and honking their way through a beautiful sunset, we all agreed that in spite of a challenging trip, we thoroughly enjoyed the experience and the diversity of the landscape. By 9 pm, we were in our sleeping bags and, after moving about gingerly for a few minutes among the roots and rocks, an ideal spot was found by all for a well-deserved sleep.